In case of any problems, please contact Monsieur Christophe Pascal in Carpentras. We will issue his numbers as well as the house number when a reservation is made. Swimming pools are always a cause for concern regarding the possibility of accidents. There are lockable gates on the fence around the pool and clients are expected to take responsibility for closing and locking the gates when they are not able to adequately supervise the activities around the pool. The telephone is set up such that you may receive incoming calls and make outgoing emergency and local calls free of charge. For other calls, it will be necessary to obtain a calling card. The hot water temperature is permanently set and cannot be changed. 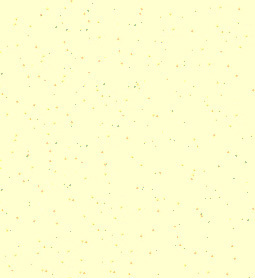 It is set at 65 degrees centigrade (approximately 150 deg Fahrenheit). This is extremely hot and may cause burns if used without mixing it with cold water. Be especially careful if you have young children. For the sake of our non smoking clients, smoking is only permitted outdoors. Please be respectful of this request. A house book is available when you arrive that contains emergency information, doctors, hospitals, restaurants, and other useful information. The water is very 'hard' (has lots of minerals) which over time cause the coffeemaker to slow down. Simply pour a half bottle of white vinegar in the water receptacle and turn it on (as if you were making coffee). Repeat the process with water to rinse the vinegar out of the machine, and then you can continue to make your coffee as usual. The dishwasher has a filter in the bottom that should be checked and cleaned out on a regular basis to maximize the efficiency of the unit and ensure the cleanest possible outcomes. Patio awning: The awning over the patio provides needed shade during the morning. It should be opened in the morning and closed in the evening. If the wind becomes strong, the awning should be retracted to prevent damage. 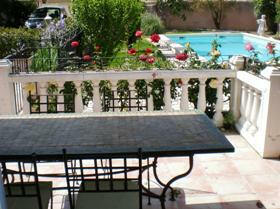 La Lavande du Plein Soleil is conveniently situated near several shopping centers. The nearest stores are in the village of Sarrians, a short walk from the house. Supermarket: There is an Intermarche on the D950. When you exit the Lotissement onto the D31(Charles deGaulle), turn right for 200 meters until the road ends. Turn right again and follow the road to a rond point (rotary) at the intersection with the D950. The Intermarche is in diagonally front of you on the right as . Centre Commercial. There is a major grouping of stores in Le Pontet, about fifteen minutes ride from La Lavande du Plein Soleil. Here you will find supermarkets such as Auchand, as well as clothing, hardware, and more. To reach this shopping center, turn left onto the D31 when you leave the lotissement and follow the D31 to the intersection with the D942. Take the D942 towards Avignon and take the exit for the Centre Commercial at le Pontet. It should take you no more than fifteen minutes. 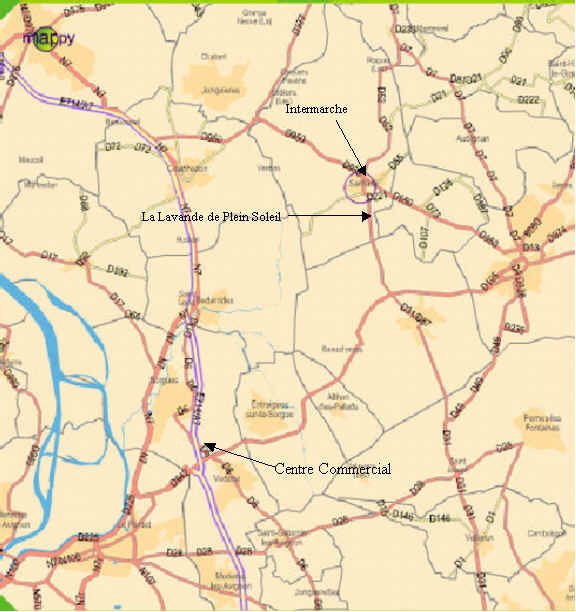 Carpentras is only 8 km from Sarrians on the D950 or the D942, Orange is approximately 20 km in the other direction on the D950, and Avignon is approximately 15 km on the D942. All have shopping facilities. 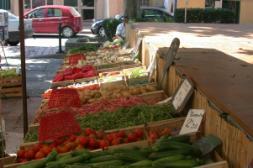 Every night there is a farmers vegetables market in Velleron from 17h to 19h. We are told the best time to get there for the best buys is around 18h. 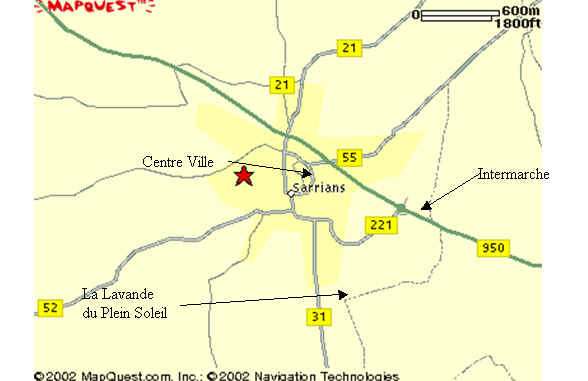 There are two small wineries on the D950 towards Orange just on the outskirts of Sarrians. Additionally, there is a wine cooperative in Beaumes de Venise, just a few kilometers north of Sarrians. The Cotes de Ventoux has become a favorite of ours. The region is rich with wines both familiar and new to US wine aficionados. Also well known are Cotes du Rhone and the Cotes du Rhone Village.